Ep. 19 (Rebroadcast): With @MohanK. 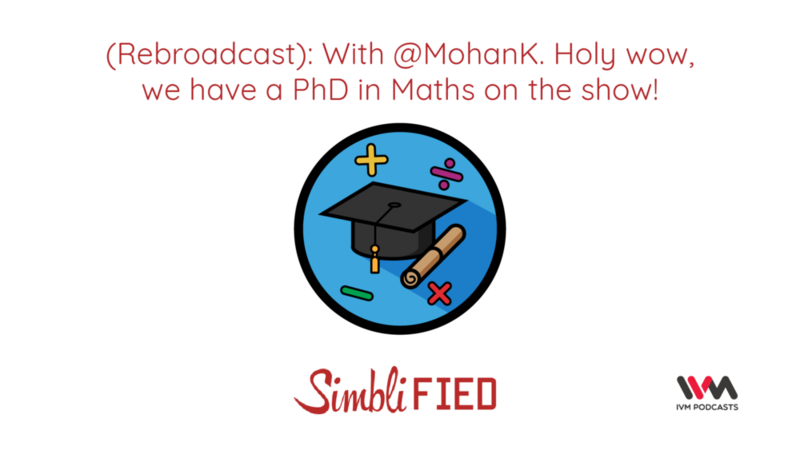 Holy wow, we have a PhD in Maths on the show! We were too lazy to record this week, so here's a rebroadcast of an old episode - one of our favourite interviews, with someone who, for some reason, decided to go and do a PhD in mathematics. He tells us what he does, why maths as a career, and makes SEVERAL poor jokes along the way. Ep. 19: We have a very unique guest on the show - one of our closest friends - Mohan Krishnamoorthy (@mohank). He's a - get this - PhD in mathematics. No no no! Don't turn off the episode just yet. He's a ton of fun and sheds light into what he actually does. He's also hilarious, and manages to out-Chuck Chuck with some absolutely hair-tearing-out puns. He's an avid trekker and loves music - so we talk about those as well. Chuck explains the math behind music and wonders why guitars aren't used in classrooms more often. Mohan lets us know about some colourful Aussie slang (not the sledging variety, thankfully). At the end of the show, you will want to: Take up maths as a career, run to the Himalayas, move to Australia and scratch Vegemite off your to-try list.